At the end of last summer (it was the day of our family’s Icebucket Challenge and quite glorious), the Boy discovered a huge, rather terrifying looking caterpillar. We found out that it was the caterpillar of the Elephant Hawk Moth. I guess that the name gives away its size. 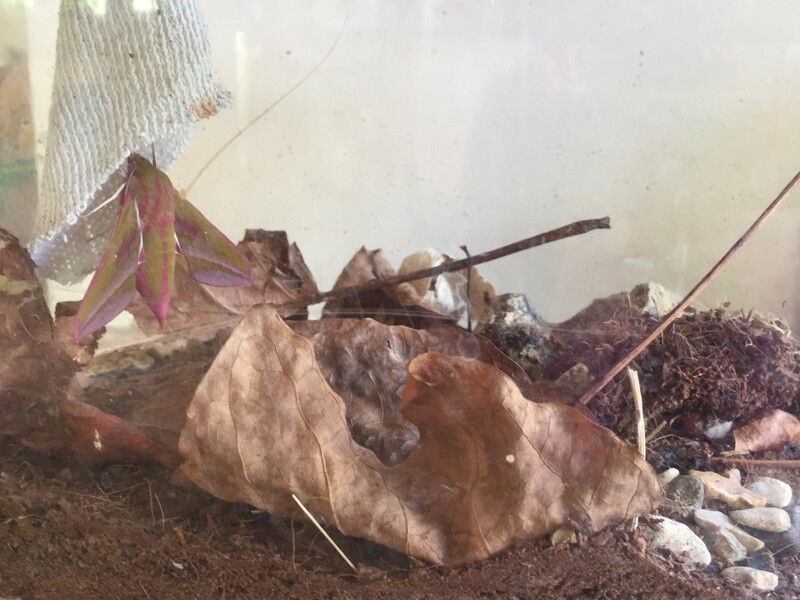 As we had an empty ‘box’ (after I failed to keep a couple of tiny African land snails alive), the Tribe decided to keep it and see if they could ‘raise’ the moth that the caterpillar would become. The ‘box’ was duly filled with some soil, stones and leaves and within days the caterpillar had dug into the soil and buried itself. This was the beginning of its metamorphisis back in September. Since then the box has lived primarily on top of the recycling bins in the conservatory, occasionally moved to the floor when bins are emptied and sometimes brought into the laundry room when the temperature’s plumetted over the winter. And of course we all lost interest – nothing was happening. Iwas pretty convinced that nothing would happen as it was so dry in the box and I thought that I would probably be cleaning out another dead occupant. But there was always a tiny part of me that hoped that something would happen. So I kept checking the box. 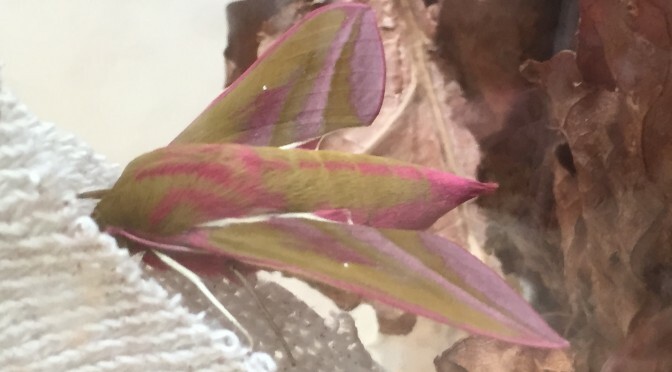 Noticing a pile of earth on top of the bins one morning, I moved the box to clear it up and there it was, in all its striking splendour – a brand new Elephant Hawk Moth! Fortunately I am not alone in my immense excitement at the moth’s arrival – all the Tribe have been thrilled (and amazed at its survival!). 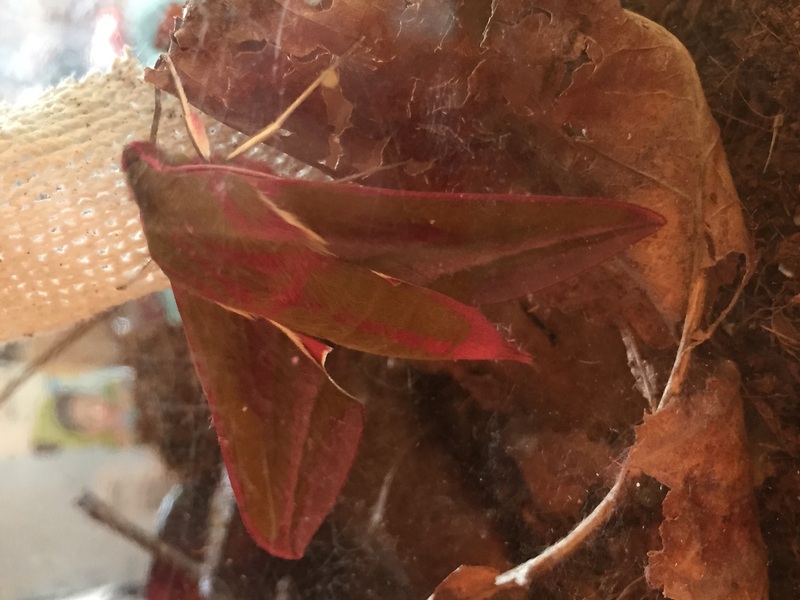 The Litllest has taken the box into Nursery to show her teachers and friends and she will probably know more about Elephant Hawk Moths than most adults. We kept the moth in the box for a few days with fresh grasses and flowers, until there was a dry evening for us to release it outside. Our feline friends however, had other ideas. Coming down into the kitchen one night, I found three completely over excited cats running around with an upturned box on the floor. I can only surmise that the moth started fluttering in the darkness and the cats jumped on the box in an attempt to ‘play’ with the moth. We never found any sign of the moth again – hopefully it flew away somewhere. Unfortunately I have a horrible feeling that it ended up as a late night snack for one of the cats. I hope that we have more success with our butterflies.